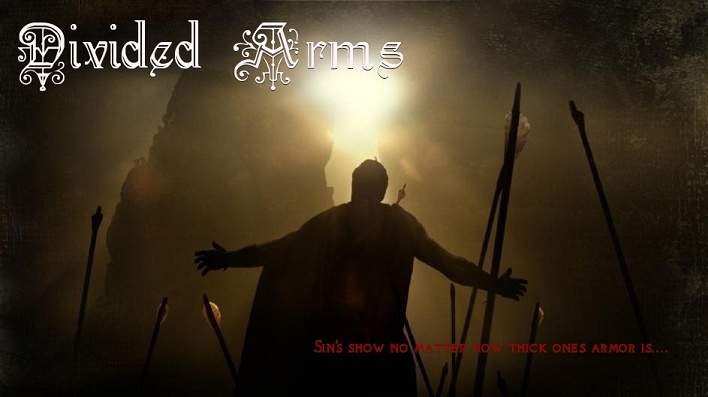 Divided Arms is a crusades style Rp site with fantasy elements included within it. Divided Arms plot is about the human race being threatened by demonic rule that held them a millennium ago. The site also offers elements of the crusade era such as Crusades and Knights fighting for power in a nation rich in climate variation. Available Classes include Knights, Paladins, Lords (kings), Warriors, Mages, and Demons. Man cannot remember the time before the demons reign over the world. The church tell that God wanted to test the world's Faith by opening the Gates of Hell to one Grand Demon.The humans proved to weak, as the Demon threw a black shadow upon the world with its power. It is said it took the Grand demon 6 days to claim dominion over the world. God was sadden by this and left the humans to there fate, planning to rebuild when all were lost to the darkness. The Grand Demon opened the Gates of Hell itself, releasing thousands of devils and spirits upon the world. Four Grand Demons joined its cause and for 1,000 years humans fell into near extinction. When it seemed all hope was lost, man fought back. Humans began being born with Magic, the demons secret art. These Mages put all there efforts into making weapons with magical powers as in Legends. The first Runes were the result of this. With this discovery, the first Paladins were created. Humans who didn't fear the demons and sought to rid the world of them. As the demons fell, the Order became smaller as a result of the knowledge magic possessed. Some people decided dealing with the magic arts was against Gods wishes.These people took up ordinary arms against the fiends and became the Templars. The Templars grew in number as the Paladins shrank as people did not wish to dabble with the arts of Demons. Even the mages separated themselves from the world in an attempt to control themselves. The Templars and Paladins joined arms to defeat the Grand Demons once and for all. The Battle of Serpent Rock was a battle to be remembered for all time. It took three full days for the Grand Demon to fall to the Paladin and Templar hands. As the people of the world cheered, Only the two groups heard the demons final words, promising to return one day with a new army to shatter the land again in its wake. The Paladins took its words to heart and waited while the Templar's were convinced the demon dead for good. The Templars became the Lords of the new Kingdoms, building the world to support life once again as they embraced the glory of winning the war on darkness. The Paladins however joined the church, waiting to kill any demon that may arise. Divided Arms offers a Storyline never seen before as well as a land to RP in that is fresh and diverse. Member interactions heavily influence the storyline. A Warrior can fight his way to become Lord over a city or even the entire nation! Knights with at least three friends can create their own Order with their own Goals and Ranks. Members can choose to fight Good vs. Evil OR fight for personal gain to further their own name. Members can command their own number of troops to participate in Wars, making allies and enemies more than just a social experience. Unique WAR feature created to simulate an actual war for land and honor! The staff is extremely dedicated to the sites development as well as to the satisfaction of the members but does so in a friendly and calm manner. Rules that are actually ENFORCED, giving members a safe environment to RP in. The site is constantly updated to reflect changes in power, however minor they may be.